Customers can buy this minutes from 6.01AM – 11.59PM. Customer can enjoy 6 Minute Talk Time GP to GP 25 Paisa Call Rate only 2 taka for 4 hours Validity. To Get This Offer Just Dial *1000*6# and Enjoy 6 Min to Any GrameenPhone Number Talk times Bonus for Lifetime. Customer can enjoy 8 Minute Talk Time GP to GP 25 Paisa Call Rate only 2.50 taka for 4 hours Validity. Grameenphone provides a New Offer where a customer can get 10 Minute Talk Time GP to GP 25 Paisa Call Rate only 2.96 taka without VAT for 6 hour Lifetime. To Get This Offer Just Dial *5000*70# and Enjoy 10 Min to Any GP Number Talk times Bonus. All Grameenphone prepaid customers (Except FlexiLoad SIM) can buy the pack. 3% SD + 15 % VAT inclusive of SD will be applicable on all charges. Customer can enjoy 12 Minute Talk time GP to GP 25 Paisa Call Rate only 4 taka for 8 hours Validity. To Get This Offer Just Dial *5000*138# and Enjoy 12 Min to Any GrameenPhone Number Talk Times Bonus for Lifetime. Customer can enjoy 20 Minute Talk time GP to GP 25 Paisa Call Rate only 6.50 taka for 12 hours Validity. To Get This Offer Just Dial *111*22# and Enjoy 20 Min to Any GrameenPhone Number Talk Times Bonus for Lifetime. Customer can enjoy 25 Minute Talk time GP to GP 25 Paisa Call Rate only 9 taka for 12 hours Validity. To Get This Offer Just Dial *111*25# and Enjoy 25 Min to Any GrameenPhone Number Talk Times Bonus for Lifetime. To check the remaining balance, customer need to dial *1000*2#. Customer can enjoy 50 Minute Talk Time GP to GP 25 Paisa Call Rate only 15.29 taka for 16 hours Validity. To Get This Offer Just Dial *111*50# and Enjoy 50 Min to Any GrameenPhone Number Talk Times Bonus for Lifetime. Customer can enjoy 60 Minute Talk Time GP to GP 25 Paisa Call Rate only 19.37 taka for 24 hours Validity. To Get This Offer Just Dial *111*60# and Enjoy 60 Min to Any GrameenPhone Number Talk times Bonus for Lifetime. At the end of the validity period. Customers need to dial *121*1*2# to know the remaining minutes balance. 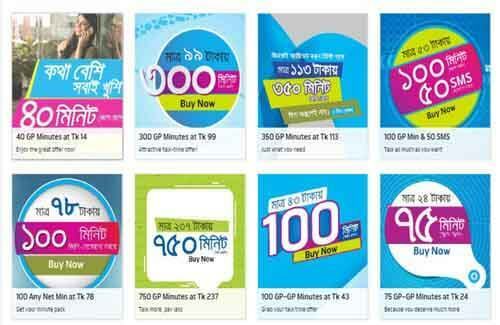 Grameenphone Customer can enjoy 200 Minute Talk time GP to GP 25 Paisa Call Rate only 65.23 taka for 7 Days Validity. To Get This Offer Just Dial *5000*135# and Enjoy 100 Min to Any GrameenPhone Number Talk times Bonus for Lifetime. Grameenphone Customer can enjoy 300 Minute Talk time GP to GP 25 Paisa Call Rate and 1GB Facebook Internet only 101.93 taka for 7 Days Validity. To Get This Offer Just Dial *5000*125# and Enjoy 300 Min to Any GrameenPhone Number Talk times Bonus and 1GB Facebook Bonus Internet for Lifetime. 750 GP-GP Minutes at BDT 237!